Note: There are some things you can’t do in this scenario—like record your meeting, upload a PowerPoint or other file, use the Skype for Business video, Whiteboard, OneNote integration, and polling and Q&A features. And you won’t be able to add people to the call—this is a you-and-one-other-person scenario. 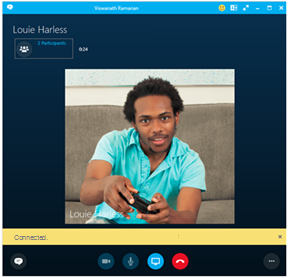 If you need any of these Skype for Business features, then you should set up regular Skype for Business meeting that is not routed through your desk phone. This is a feature that your admin has to configure for your company. There’s a really easy way to tell if your company has this enabled this functionality. From the main Skype for Business window, click the gear icon ( ) to bring up the Options dialog. 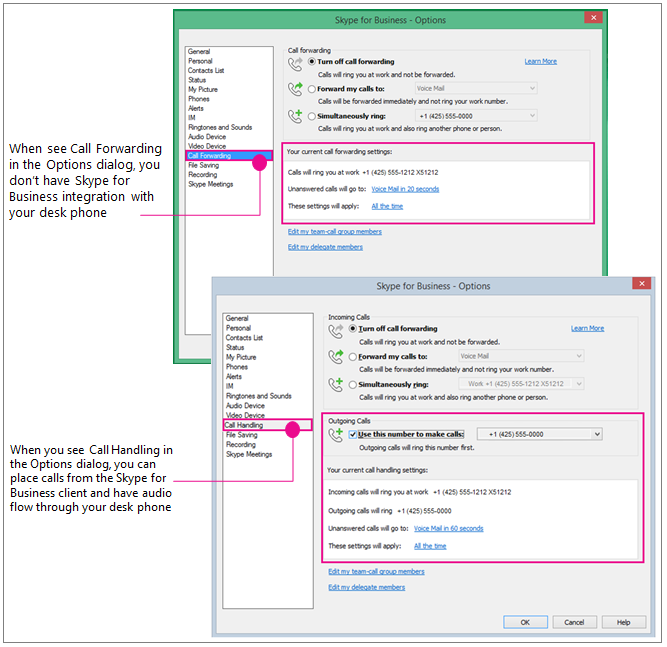 If you see Call Forwarding in the list, then Skype for Business is not set up to work through your desk phone. 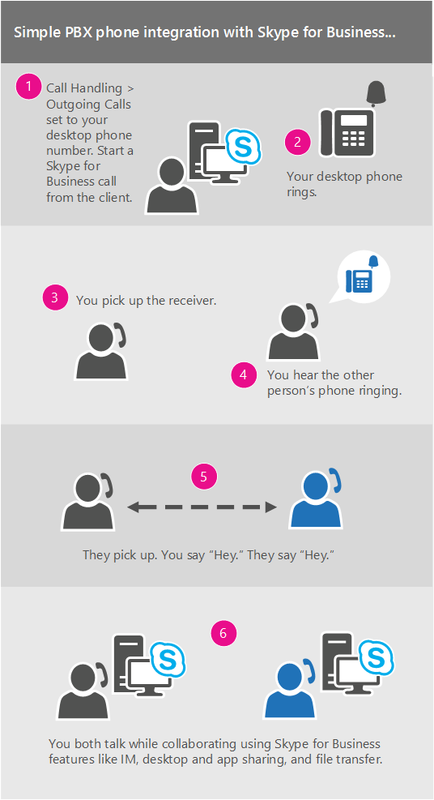 If you see Call Handling in the list, then your desk phone is integrated with Skype for Business. If you want to use your Phone System desk phone for your Skype for Business audio, just set the Outgoing Calls option to use that number. Important: People with a private line, or those with the assigned role of boss, delegate, team leader, team member, or response group member can't use this feature. 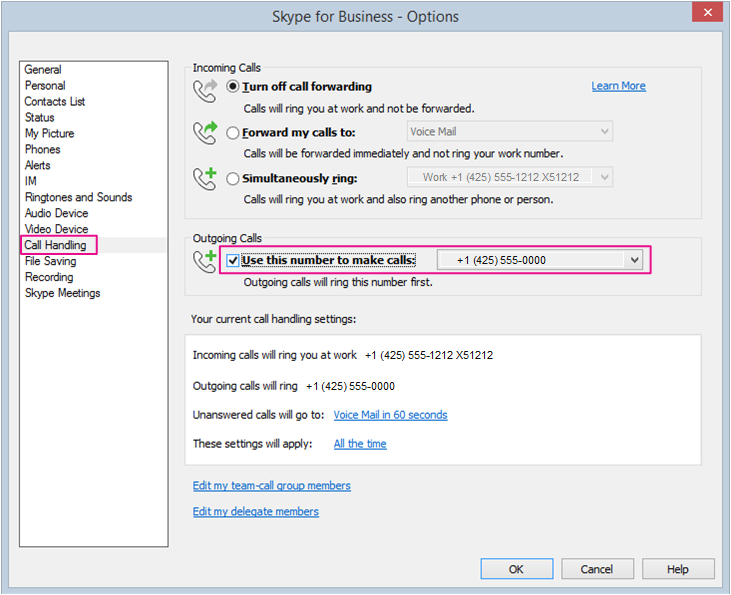 Changing your configuration to use Skype for Business with your desk phone will disable the call handling/call forwarding settings you need to do those other jobs. Also, if you change these settings, for example to forward Skype for Business calls to your mobile phone while you are away from your desk (or if you use the Skype for Business Online client—which automatically sets Simultaneously ring to your mobile number), you’ll need to change the settings back again if you want to make a Skype for Business/Phone System desk phone call later, when you return to your office. Under Outgoing calls, check the Use this number to make calls checkbox, then enter your Phone System desk phone number—including your extension, if you have one. Once the outgoing call number has been set to your Phone System desk phone, then when you initiate a call from the Skype for Business client, Skype for Business calls your phone first, you pick up the receiver, you’ll hear the other person’s phone ringing, then they pick up and you are set! 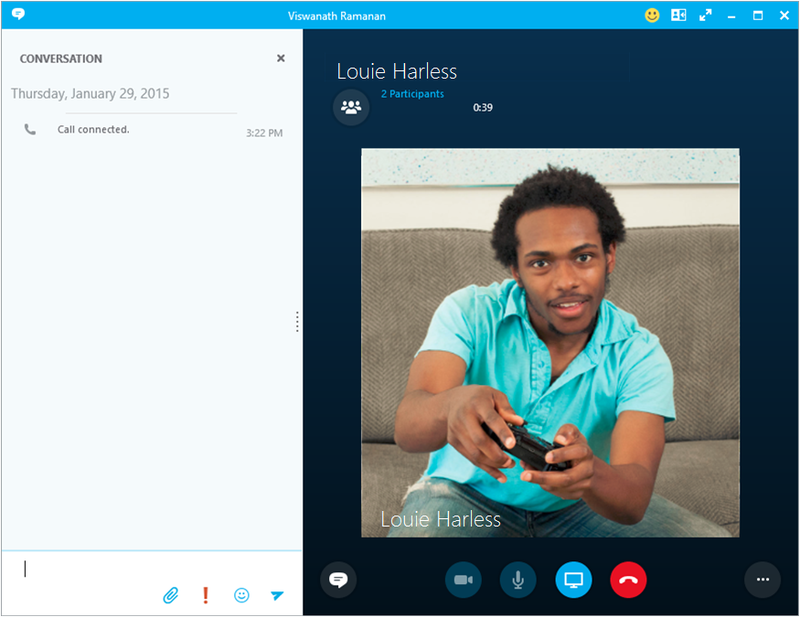 Chat and use the Skype for Business client to share and show.